During the Regency period, men’s fashion underwent a change as knee breeches were exchanged for trousers. Although trousers had been entering fashion since 1800, they only became appropriate casual and semi-casual wear for men between 1810 and 1820. 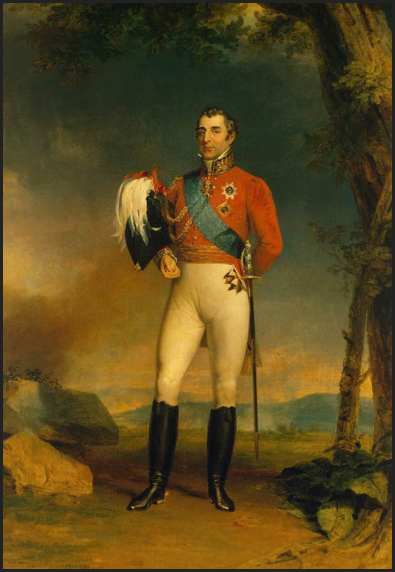 In America, James Madision (in office 1809-1817) was the first President to wear trousers instead of knee breeches, and the future Duke of Wellington, Arthur Wellesley, had been turned away from a fashionable London social club in 1800 both for tardiness and for wearing trousers, which were against the strict dress code. But Hessian boots were unsuitable for wearing under the newly acceptable trousers, so Wellington instructed his shoemaker Hoby of St. James Street, London to modify the popular boot. The result was cut higher in front to cover and protect the knee and had the back cut away, in order to make it easier to bend the leg. It was also cut closer to the leg. They quickly gained a reputation as hard wearing in battle yet comfortable for evening wear. After Wellington’s defeat of Napoleon, “Wellington boots” became extremely popular as stylish footwear that could be worn with trousers. I beg that you will make for me two pairs of Boots, of the usual form only four (or the thin of an hand) lines longer in the foot than usual. Send with new false soles that will fit this new size. If needed make them broader. If these boots should suit me I will send another [pair] of galoshes. If I fit them; and [a pair] of shoes of the same size. I beg to have these boots as soon as possible, as I am pained by those which I wear at present. The boot evolved again when Charles Goodyear invented the vulcanization process for rubber. In 1852 Goodyear met American Hiram Hutchinson, who bought the patent to manufacture footwear and established his company A L’Aigle in France. The footwear was an immediate success, replacing wooden clogs among farmers. Four years later, entrepreneur Henry Lee Norris established the North British Rubber Company (which would later become the Hunter Rubber Company) in Scotland. Initially produced in limited quantities, the popularity of the rubber Wellington boot skyrocketed during World War One. The United Kingdom Office of War hired the North British Rubber Company to produce a boot suitable for the trenches in France and Belgium, and during the course of the war nearly two million Wellington boots were sold to the army. 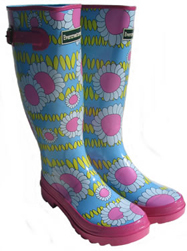 Wellingtons remain popular today and come in assorted colours and patterns to suit your fashion needs, although it’s hard to picture the Iron Duke wearing a pair of these! A pair of the Duke of Wellington’s boots is on display at Walmer Castle, where he lived for 23 years. For more information on changing men’s fashions in the Regency, visit Jessamyn’s Regency Costume Companion. I didn’t know that the history of a boot could be so interesting. Very good, and informative, article. Great topic, although REAL Wellies are black. A curious thing–although he’d had his leg measured for height and width as did they all for their riding boots, still the foot of the boot had no distinct right or left, but the shoe-part of the boot had to broken in (as did their regular shoes) as ballet shoes do today. Shoes and boots didn’t have a specific right or left until the 1850s. Also, the Hessian boot, as well as being lower-cut and not up to just below the knee–also has a specific cut to the front, sort of like the top half of a heart-shape. And it’s from the inner dip that the tassle is suspended. Long boots are about though in the late 18th century–often with long brown tops. You can see them in portraits of jockeys by Stubbs. Thank you for the interesting additional information on this topic. Hi, I am so happy to have found this article. Thanks fr such great info on the boots. I am quoting credited on May 10 2016 at http://fangswandsandfairydust.com/2016/05/hessians.html Post will not be up until them.